CHICAGO, 2017-Mar-14 — /Travel PR News/ — Hyatt Hotels Corporation (NYSE: H) announced today that a Hyatt affiliate has entered into a management agreement with Tokyo Bay Resort Development Co., Ltd., a subsidiary of Sogo Development Co., Ltd. for a Hyatt Place hotel near Tokyo Disney Resort in Chiba, Japan. 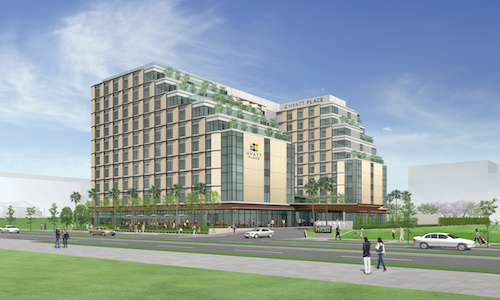 Upon its expected opening in 2019, Hyatt Place Tokyo Bay will be the country’s first Hyatt Place hotel. Hyatt Place hotels offer casual hospitality and purposeful service in a smartly designed, high-tech and contemporary environment. Hyatt Place Tokyo Bay will be located at Urayasu City in Chiba Prefecture, less than three miles (4 kilometers) from Tokyo Disney Resort, one of Tokyo’s premier travel destinations. It is also conveniently located between both of Tokyo’s airports, 12 miles (20 kilometers) from Haneda Airport and 31 miles (50 kilometers) from Narita Airport. The 10-story hotel will offer 365 guestrooms including two suites, 1,900 square feet (180 square meters) of meeting space, an all-day dining facility, and a 24-hour gym. About Sogo Development Co., Ltd. Founded in November 1963, Sogo Development Co., Ltd. is a part of the Sogo Development Group, a holding company that develops, leases and manages real estate. Sogo Development Co., Ltd. develops, manages and leases commercial facilities and office buildings. With the Hyatt project as a cornerstone, the Company plans to actively develop and manage hotels. Hyatt Place, a brand of Hyatt Hotels Corporation, combines style, innovation and 24/7 convenience to create a seamless stay with modern comforts. There are more than 270 Hyatt Place locations in Armenia, Brazil, Canada, Chile, China, Costa Rica, Honduras, India, Mexico, Morocco, Nicaragua, Panama, Puerto Rico, Thailand, The Netherlands, United Arab Emirates, United Kingdom, and the United States. For more information, please visit hyattplace.com. Join the conversation on Facebook and Instagram, and tag photos with #HyattPlace and #WhySettle. Hyatt Hotels Corporation, headquartered in Chicago, is a leading global hospitality company with a portfolio of 13 premier brands. As of December 31, 2016, the Company’s portfolio included 698 properties in 56 countries. The Company’s purpose to care for people so they can be their best informs its business decisions and growth strategy and is intended to create value for shareholders, build relationships with guests and attract the best colleagues in the industry. The Company’s subsidiaries develop, own, operate, manage, franchise, license or provide services to hotels, resorts, branded residences and vacation ownership properties, including under the Park Hyatt®, Miraval®, Grand Hyatt®, Hyatt Regency®, Hyatt®, Andaz®, Hyatt Centric®, The Unbound Collection by Hyatt™, Hyatt Place®, Hyatt House®, Hyatt Ziva™, Hyatt Zilara™ and Hyatt Residence Club® brand names and have locations on six continents. For more information, please visit hyatt.com. Forward-Looking Statements in this press release, which are not historical facts, are forward-looking statements within the meaning of the Private Securities Litigation Reform Act of 1995. Our actual results, performance or achievements may differ materially from those expressed or implied by these forward-looking statements. In some cases, you can identify forward-looking statements by the use of words such as “may,” “could,” “expect,” “intend,” “plan,” “seek,” “anticipate,” “believe,” “estimate,” “predict,” “potential,” “continue,” “likely,” “will,” “would” and variations of these terms and similar expressions, or the negative of these terms or similar expressions. Such forward-looking statements are necessarily based upon estimates and assumptions that, while considered reasonable by us and our management, are inherently uncertain. Factors that may cause our actual results, performance or achievements to differ materially from current expectations include, among others, the rate and pace of economic recovery following economic downturns; levels of spending in business and leisure segments as well as consumer confidence; declines in occupancy and average daily rate; the financial condition of, and our relationships with, third-party property owners, franchisees and hospitality venture partners; the possible inability of third-party owners, franchisees or development partners to access the capital necessary to fund current operations or implement our plans for growth; risks associated with potential acquisitions and dispositions and the introduction of new brand concepts; changes in the competitive environment in our industry, including as a result of industry consolidation, and the markets where we operate; general volatility of the capital markets and our ability to access such markets; and other risks discussed in the Company’s filings with the U.S. Securities and Exchange Commission, including our Annual Report on Form 10-K, which filings are available from the U.S. Securities and Exchange Commission. These factors are not necessarily all of the important factors that could cause our actual results, performance or achievements to differ materially from those expressed in or implied by any of our forward-looking statements. We caution you not to place undue reliance on any forward-looking statements, which are made only as of the date of this press release. We undertake no obligation to update publicly any of these forward-looking statements to reflect actual results, new information or future events, changes in assumptions or changes in other factors affecting forward-looking statements, except to the extent required by applicable law. If we update one or more forward-looking statements, no inference should be drawn that we will make additional updates with respect to those or other forward-looking statements. This entry was posted in Business, Hospitality, Hotels, Travel, Travel Management, Travel Services and tagged Hirohide Abe, Hyatt Hotels Corporation, Hyatt Place hotel, Hyatt Place Tokyo Bay, Shinya Ozawa, Sogo Development Co., Tokyo Bay Resort Development. Bookmark the permalink.